Well I stopped off at my usual beer store, State Line Liquors, like I do on most Friday’s after work. I had my fall beer wish list with me, what you don’t have a fall beer wish list? So I’m picking up some German Oktoberfest and a few other German brews. As I made my way back to the domestic section I saw a variety case on the floor. I didn’t even look at it I just put it into the cart, well I did notice that it was $35.00 so I put back a few other beers, really, I did. I know Robert Murray the owner fairly well so I know I could trust whatever he put into the variety case but I assumed it was fall seasonal beers. Similar to what he did this time last year. Well when I got home and opened the case, to my surprise, low and behold, PUMPKIN ALES! 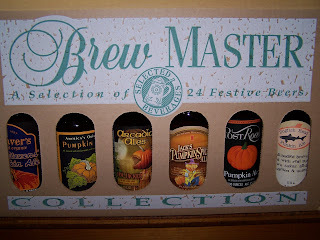 12 different pumpkin ales 2 each. It looks like there are only two of them that I’ve already had this year and 4 of them where on my Fall Wish List. You really should get one of those. The hilarious part about this is that just two weeks before this I had a conversation with Robert about his fall variety case. I jokingly suggested for him to put a case of Pumpkin Ales together for me. So when I opened up the case I was just in stitches. I had no idea he actually listened to me, no one ever does that. 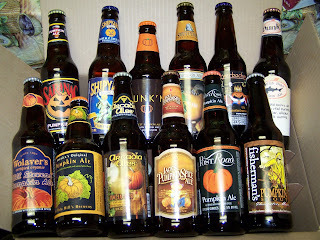 So here is a preview of some upcoming Pumpkin Ale Reviews, in no particular order. Except for the ones I’ve already done, maybe I’ll share them with someone. i liked the post road but felt most of the others i tasted were trying to hard with the fall spice... and one had a painfully sour finish. harvest moon still has my heart. Clare, So far Post Road is my favorite but I still have 10 more to try out of this sampler case. I can see what you like about Harvest Moon; it’s a good amber ale with a hint of pumpkin. I’m bracing myself or some of these to come. I think I’ll do a few Germans first.